I couldn’t resist this opportunity! Boyfriend’s been away for work whereas I had to stay back to work, so I HAD to go meet up with him somehow! Didn’t matter if news had been circulating worldwide about all the scary-sounding “urban warfare” and “street battles” that had been going on over there. Once I got out from the Suvarnabhumi Airport, I made my way towards a bus-ticket counter located outside the airport. From what I was told, that’s the only licensed bus company at the airport area that takes tourists to their chosen destinations. “Take bus number 2 to Khaosan Road. I’ll meet you there,” boyfriend had said. Khaosan Road or Khao Sarn Road is a short street in central Bangkok, Thailand. 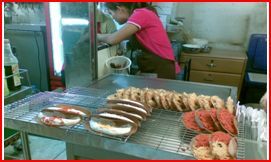 “Khaosan” translates as “milled rice”, a reminder that in former times the street was a major Bangkok rice market. 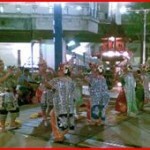 In the last 20 years, however, Khaosan Road has developed into a world famous “backpacker ghetto”. Pic 01: View from Bus #2. Bus ticket fare: 150 baht. There were just about a handful of foreign backpackers in the bus that day. 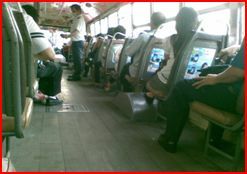 “Sit on the left side of the bus. That’s where all the good view is,” he told me through the phone. He was right. And somewhere along the way, I noticed a big group of people who had gathered together by the roadside on that sunny Tuesday morning. “Oh no, is that what I think it is?” my mind started playing tricks on me. 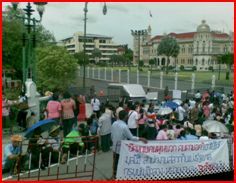 I saw a few people in the group dressed in colourful wigs and noticed they had also set up loudspeakers. It’s a peaceful gathering of a group of fun-loving people, so I started to relax once again. All those news reports simply weren’t helping to ease my thoughts throughout my journey. Many of the places I saw had pictures of their king, Bhumibol Adulyadej, placed either at the entrances or at very noticeable parts of their buildings. The people’s reverence for their king is simply astounding. Thailand is a country steeped in a breathtakingly exotic history. You can read all about the history here as I’m not a qualified historian to go spinning yarns about this fascinating country. I finally reached Khaosan Road. The presence of so many stalls all over the place seemed somewhat overwhelming to me at first, but this was only Khaosan Road at its less-vivacious, somnolent state during the daytime. This Youtube video captures the mood of Khaosan Road very well. 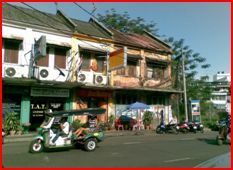 Khaosan Road, a place unique in itself, exudes its own sense of decadent charm. Tourists who come here usually just want to go all-bohemian and experience life on the wild side… well, pretty much…. 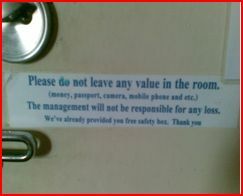 (Pic 05) Sign at guesthouse door: “Please do not leave any value in the room”. The first thing boyfriend and I did was to look for food. So many food-stalls, which one to choose? 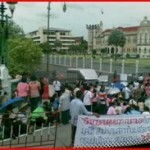 While looking for a place to eat, I noticed a few stalls offering fake degrees/diplomas and driving licenses for sale! For just about 150 baht, you could look through a catalogue of certificates or IDs that you want, pay a deposit, and collect your authentic-looking document a few hours later. Fancy getting yourself a qualification from Harvard without even having to go there! We finally settled for a busy-looking roadside eatery (hey, if they’ve got many customers, so it’s supposed to be good, innit?). Without having to say a word to the people taking down our food and drinks orders, we just kept pointing at the menu for what we wanted. It’s easier that way because the people who took our orders didn’t speak English. 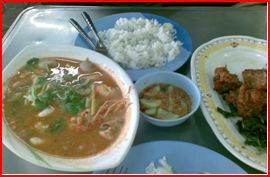 Pic 06: Yummy “tom yum” (on the left) and a dish of something-I-really-don’t-know-but-tasted-like-fried-pork-fat-with-crunchy-deep-fried-leaves (on the right). Pic 07: Cute little naked cherub on a scooter somewhere around Khaosan Road. Pic 09: How much more “extra” can an ordinary man get? 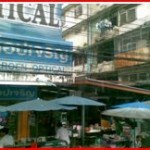 There are many shopping areas to visit while in Bangkok. But do go to MBK Centre when you’re there. MBK Centre is only one of the largest shopping centres in Bangkok. There’s another shopping centre in Bangkok, CentralWorld, which used to be the third largest shopping complex in the world, but that place suffered extensive damage during the showdown between the Red Shirts and the Thai military. We walked past CentralWorld to see the damaged building, but couldn’t see much because the whole place was already surrounded by tall corrugated iron sheets. It’s hard to believe that just a few weeks ago, that whole city area had its daily activities come to a standstill because of the riots that had taken place. It’s such a pity that all of the high-end shops you could ever think of were located in CentralWorld. And never, ever ever miss out on the Chatuchak Weekend Market when you’re in Bangkok. I wish I had remembered to take a picture of that place, but I completely forgot about that the moment I got there! It’s impossible to finish touring that place in just one day! 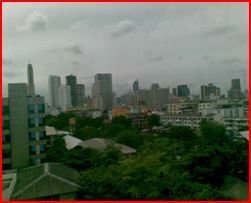 Pic 10: Walking around Bangkok. 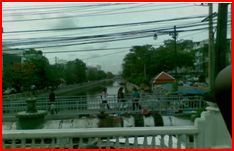 Not every part of Bangkok is teemed with tourists. Once, we wandered a bit too far from the more tourist-friendly areas and suddenly found ourselves somewhat lost in the shadier parts of Bangkok. I felt as though we had just walked into the back alley of a slum area. Actually, I think we did walk into the back alley of a slum area. So if you’re not the kind of person who knows self-defense, please avoid walking too far away from the more decent areas in town. Take a tuk-tuk or taxi instead. 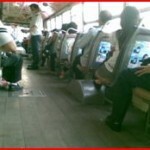 Pic 10a: Bus-ride around town- cheaper by the dozen. Boyfriend and I decided to visit Patpong just for fun. It was still day-time when we got there and the whole place still looked deserted. 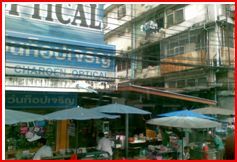 Patpong is a well-known red-light district in Bangkok. Anyway, we didn’t return to Patpong during the night-time, though. 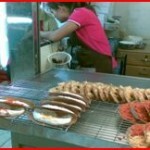 Pic11: Try this when you see this tasty, unique-looking confection in Bangkok. I’m not quite sure what it’s called. 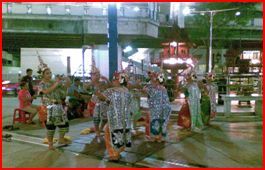 Pic12: Traditional Thai dance outside a shopping centre. 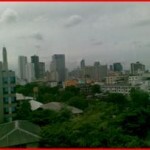 How does one go about choosing the best place to stay when in Bangkok? Simple. Just look through the “Lonely Planet” book for the recommended places. We’ve noticed many “farangs” walking around holding those books. For those with cash to spare, I would recommend the Dusit Thani Hotel in Bangkok. The BF: Hi, is this ***** Guesthouse? The BF: Do you have air-conditioned rooms available? The BF: How do we get there from the train station? The BF: Do you speak English?? No, no, no!!! 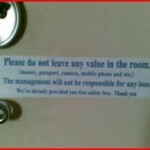 You don’t want such things to happen to you while travelling in a foreign land! 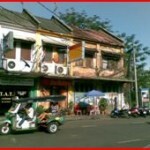 Pic13: Just look through the “Lonely Planet” guidebook for a place to stay in. You could sometimes end up lucky choosing really cheap accommodation located in really cozy corners in the least expected parts of town. And now with tourism so badly affected because of the previous street riots, guesthouses have resorted to insane price-slashing for the time being. We’re done with Bangkok for now. Here’s a picture taken during our overnight train ride from Bangkok to Chiangmai. Do go for the first-class rides (costing slightly more than 1,000 baht per person) as the beds are pretty comfy and you get to have your own private room-for-two without having to worry about anyone trying to steal your bags.